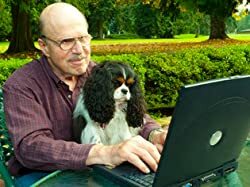 Aaron Elkins is a former anthropologist, who began writing mysteries and thrillers since 1982, and won many awards for his bestselling titles. His work has been selected and published in the Literary Guild, and the Readers Digest Condensed Mystery Series. Aaron has taken on the nickname "father of the modern forensic mystery"! Aaron currently resides on Washington's Olympic Peninsula with his wife and serves as a forensic anthropologist on the Olympic Peninsula Cold Case Task Force. Please enter your email address and click the Follow button to follow Aaron Elkins! When Gideon Oliver's wife Julie attends a conservation forum on the emerald Isles of Scilly, Gideon tags along, expecting a holiday. To amuse himself, he explores the Neolithic sites there. But instead of ancient ruins, he finds evidence of a very recent murder. Book 11 of the Gideon Oliver mysteries finds Gideon on vacation with his wife in Italy. However, things take a troubling turn when their host's only child goes missing and local construction workers find bones in the ground.